Note: This piece will serve as a bridge/introduction to other music-related pieces which I will be writing in the future. Stay tuned for more! If you have been dancing casino for a while, chances are the word “clave” is not new to you. Indeed, some instructors teach with the help of this instrument, or mention its importance during their lessons. On the other hand, when some people talk about finding the one count, many use the clave pattern that is implicit or explicit in the music as a point of reference. But what does that mean? Let’s find out. So, the clave goes: pah-pah-pah…pah-pah. The sticks touch five times. Let’s call the “pah-pah-pah” the “3 side” of the clave (because the claves touch three times), and the “pah-pah” the “2 side” (because they touch twice). Now, the video says this is a 3-2 clave. Why is it called this? Because when he began playing the clave pattern, he began with the 3 side, which was then followed by the 2 side. Therefore, 3-2. What would playing a 2-3 clave mean, then? So, the clave goes: pah-pah…pah-pah-pha. Now, the thing that you probably noticed when you watched this second video is that, as the clave played along, even if it started on the 2 side, in your head, it became a 3-2 clave. That is, you were hearing “pah-pah-pah.. pah-pah” (3-2) as it kept playing. So, even if you knew it was a 2-3 clave, when you listened to it as a loop, it became a 3-2 clave. We can say, then, that the clave, in its “natural state,” is a 3-2 clave. That’s why there are some people who would argue that the 3-2 clave is the only clave there is. So, if the 2-3 clave is going to become a 3-2 clave, anyway, why make the distinction in the first place? This is the part where knowing a bit of how the music works helps. If you looked at the numbers as I suggested, you should have noticed that the numbers went from 1 to 4, and then from 1 to 4 again. The count did not go from 1 to 8, which is the count that we, as dancers, use. For us who dance, we start moving our feet to dance on the 1, and we consider that we have done a full basic step when we get to 8 (or 7, if you do not count the 8, which is, nonetheless, there). But the musician is not counting from 1 to 8, like we are doing as dancers. The musician is counting from 1 to 4! So, in the same span of time that we dancers count from 1 to 8, musicians count from 1 to 4 twice. So musicians have two 1 counts, when dancers only have one. If you go back to that last video you and you look at the numbers, you will see that, below them, right on the line, there are these “p” looking things (these are called quarter notes; the second “pah” on the 3 side is actually an eight-note). These quarter notes indicate where in the count each “pah” of the clave gets played. As you can see, no matter if it’s a 3-2 clave or a 2-3 clave, the 3 side of the clave takes four counts, and the 2 side of the clave takes the other four counts. That is, each individual side of the clave (3 or 2) gets its own 4 counts. And that is where the 3-2 clave and the 2-3 clave distinction comes in. The 3-2 clave, or 2-3, refers to the side of the clave on which the musicians choose to have the 1 that we, as dancers, hear. So this is clearly a song with a 2-3 clave. Let us go back to the two claves, and how they are used in the songs, lest we wander off too much into other topics. So, let us talk a bit more about the music. Do you remember the music bar on the clave video that I told you to took at? Do you remember how it is divided into two sets of four? Well, each one of these sets is called a measure. When combined (because the clave takes up two of these measures), they form what is called a “phrase.” A phrase just means (very broadly) that consecutive notes, when grouped together, get played a certain way. This type of music we listen to (son music) is played, for the most part, using this two-measure phrasing. That is, the pattern of the piano, bass, cowbell, timbal, bongo, and conga happens within these two-measures phrase, and then it repeats again. Because this two-measure phrase the piano plays (and the timbal, cowbell, bass, etc) has a beginning and an end spanning both measures, that is why we, as dancers, only hear one 1, even though each of the two measures of the phrase have their own 1. And it is the musicians who choose, when playing a song, on which side of the clave they will begin, and on which side they will end. Therefore, in a 2-3 clave, the phrase begins on the 2 side, and ends in the 3 side. And in a 3-2 clave, it is the exact opposite. That is why some people make so much emphasis on talking about what clave the song is on: because, once you know the type of clave that is being played in a song, all you have to do is listen for that clave and, once you find it, you will know where the 1 count (the beginning of the phrase) is. But again, each of the two measures in the phrase has its own 1, which theoretically means that musicians have two 1s to work with (whereas we dancers have one longer set of eight counts). That, in turn, means that they can switch where our 1—the dancer’s 1—is within the clave pattern in the same song. So they can start the largo with the 1 being on the 3 side, but when the montuno kicks in, with the call and response and the cowbell, they can switch the 1 to the 2 side. This does not happen often, but it does happen, and I point it out because it proves the point that I am trying to make–that is, that the musicians can–and do–work with two 1s. The song I always like to use to illustrate this is Pancho Amat’s rendition of Miguel Matamoros’ “Lágrimas negras”. Fast forward the video below to 4:35. From 4:35 to 6:32, it feels better to dance with the one being on the 3 side. But after 6:32, and especially after 7:07 it feels like the one is on the 2 side of the clave. The same thing happens with the Adalberto song we listened to earlier. If you now listen to it from the beginning, you’ll realize that, when the song begins, it begins on the 3 side of the clave. And it stays on that side until about 0:47, when the emphasis switches to the two side. Regardless of where the dancer’s 1 actually is, there is nothing that says that you have to dance to a certain 1 count. Because musicians are using two 1s, you, too, could use any of the two. Either way, you will be hitting a 1 count. Hitting the “right” 1 count becomes more important when you want to apply some musicality to your dancing; you want to get the “hits” that are happening in the song, you want to be more connected to what the instruments are doing. Then yes, going with the “right” 1 there matters, because that is the one that the musicians are emphasizing. And that is when what I am about to say matters: Most of modern son music (timba, if you want to call it that) produced by Cuban musicians nowadays is done on 2-3 clave. That is, once you hear the 1, you can assume, with a very good degree of certainty, that the one you are hearing is happening on the 2-3 side of the clave. Therefore, if you hear the clave in the song, the 1 will most probably be on the 2 side. If this is the first time you are being exposed to these concepts, I hope you did not just read through. I hope that you actually took the time to listen to the examples. Otherwise, you will not really benefit from this post. (Though what I think will be even more beneficial than this post is to learn about the role the conga drums in your dancing. In fact, I consider the conga to be more important for the dancer, and specially beginner ones, than the clave. So I highly recommend that you take a look at this post in which I actually advocate against clave and in favor of the conga drum. Returning to the clave now: Do come back to this piece every now and then, and listen to the examples again. The more you do it, the more you will understand it. Clave is not something that is learned in a day, or two. It took me months to understand these things. So do not feel discouraged if you do not get this at first. Keep listening. Keep practicing. P.S. The way I have explained clave here has been specifically tailored for people who are dancers, not musicians. That is why I have tried to avoid much of the musical jargon that would usually characterize any explanation about clave. That said, there is an outstanding piece on this clave difference written by none other than the great Kevin Moore, which, if you feel adventurous enough and willing to take on the challenge, you can read it in this four-part study here. I little understanding of the musical concepts goes a long way; thanks for yet another excellent piece to share with our students. Your comments on modern Son produced outside of Cuba are intriguing: much of the modern non-Cuban Son I listen to has 2-3 Son clave – on reflection I DO have a lot of New York “Salsa Dura” in my collection, which has always struck me as having more in common (with regards to the musical arrangements) with its Cuban antecedents than other modern non-Cuban Son. Perhaps the clave order is why that is so, or at least part of the explanation. On another note, I am glad you distiguished between Rumba and Son clave. Some teachers I have had insist (incorrectly) that Son clave = 3-2 clave = “white” clave and Rumba clave = 2-3 clave = “black” clave. Rumba clave is probably a whole topic on its own but suffice to say that both Rumba and Son clave patterns can exist in either 2-3 or 3-2 orientation relative to the phrasing in the music and they can change within a song as you so well describe when discussing Matamoros’ composition above. A lot of modern Son (including Timba) doesn’t use this switch between 2-3 and 3-2 clave pattern, some notable exceptions being the compositions of Juan Formell and Maykel Blanco – I’m sure there are more but these two spring to mind immediately. In older Son, however, it is not uncommon. My explanation for this has always been that older Son had limited instrumentation available to their trios, sextets and septets, so a switch in clave between largo and montuno sections allowed the composer to introduce a little (well, a lot actually) variety into their songs. Modern Son bands are often larger and can introduce that variety into their song arrangements through instrumentation rather than composition. Thanks again and keep up the great writing. Actually, there are plenty of Timba songs where you can encounter “clave license” in one form or another. This was very much developed by Formell and Pupy, so you do hear a lot of that in their songs, but they are by far not the only ones doing that. Just an example right off the bat. Contrabando – Fe Con Bendiciones. I think that there are at least 2 or 3 clave changes in that song (don’t remember exactly). Also, I think that in Timba music the devision between using 2-3 or 3-2 clave is much less sharp compared to “salsa” music or to traditional Son music. Because Guagaunco and other types of Rumba music are major roots of Timba, one can hear plenty of songs in 3-2 Clave (mainly 3-2 Rumba Clave, BTW). I haven’t ever tried counting how many songs are there with each type of clave, but even that there most probably are >50% of songs in 2-3 (Son or Rumba) Clave, it’s not such a big numerical advantage, and many Timba songs are in 3-2 Clave. You say that the musician counts in 4 beats, while the dancer counts in 8 beats. I see what you mean in a formal sense, since the music is in 4/4 with 4 beat measures. But it seems to me that this fact doesn’t get at the heart of the 3-2 vs 2-3 clave distinction, which hangs on the broader phrasing of the music and the musicians playing as a whole. In the end, I think we may be on the same page on this, but you can tell me. The music has very strong two-measure phrases and even “sentences” in higher multiples that are defined by the harmony and melody. As a musician and a dancer, I experience both the rhythm and the melody/harmony together in 2 measure phrases. Looked at this way, the 3-2 vs 2-3 clave are two rhythmic choices that contrast or complement the rhythm expressed in the melody, harmony, and two-measure percussion like the conga. When the song switches (e.g. chorus to verse), the clave and other instruments change together (or not, if that makes more sense). So it’s all about musicians working together as a band, and I think you suggested that the dancers SHOULD be part of this whole. Of course, that is sometimes not true in salsa dancing, where it is often considered a mistake to mix up 1 and 5 (or 2 and 6), but that might make the most musical sense if you pay attention to the rhythm more than the melody/harmony. Maybe now I can understand why so many Cuban dancers that I’ve watched switch frequently between 1 and 5 dance timing. Personally, I have been conditioned so hard by the standard paradigm, that it’s hard to step “1” on beat 5 of the music. Sometimes it would be nice to dance to music that has ONLY percussion. “Two-measure phrases and “sentences” ” – spot an Allan, great description! Thanks for your feedback, Allan! I have incorporated into the piece a small section about phrasing and measures, which I now realize was sorely needed. Oh, and don’t worry – there’s nothing “wrong” with switching from one “1” to the other “1”, as musicians often do, and so do many Cubans and other “natural” dancers from Caribbean and Latin American countries. I have a question/doubt and I hope you can answer it. Most of the time when I am hearing any SON or Timba song, I usually try clap my hands to the SON clave rhythm (2-3 / 3-2). In most of the songs the clave is implicit or can be heard for a few seconds. In all the songs I hear, I am able to clap to the SON Clave rhythm. Suppose if there is a song with a rumba clave in it and suppose the rumba clave is implicit, can I still clap to a SON clave rhythm for the same song and feel the music aligning with the clave? Right now I am able to tell if a song is on Rumba Clave if and only if I can hear the rumba clave clearly. Also I am not able to clearly understand as to why some musicians choose to play on rumba clave instead of son clave? I just know the theoretical explanation that rumba clave adds a syncopation which some musicians prefer. But I am still confused. Well, here is the thing: the so-called “son clave” is actually a rumba clave, too. Indeed, if you listen to rumba yambú, you will notice that it uses the same clave as son sometimes (“Ve y dile a tu mamita” by Conjunto Clave y Guaguancó comes to mind). Son didn’t always have clave. 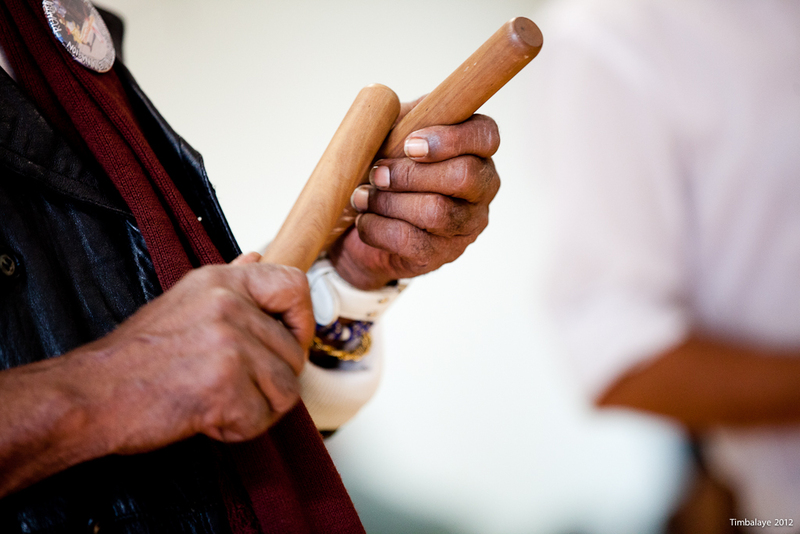 The clave came in when the eastern son go to the western part of Cuba and mixed with the rumba tradition (rumba is from Matanzas, in the western part of Cuba). My personal theory is that son at first adopted the yambú clave and not the guaguancó clave (what you call “rumba clave”) because of the slow pace of the songs (listen to anything by Sexteto Habanero in the 1930s), creating a parallel with the slow-paced yambú. After the 1940s, with the creation of the son montuno (Arsenio Rodríguez) guaguancó began playing a more integral part in son, as the sections of a guaguancó song were transfered, in part, to a son song. But the clave pattern was still that of yambú. That’s why you’ll hear singers say “guaguancó”, time and again, even though they are playing son. To see this in practice, take, for instance, Pete el Conde’s song tittled “La esencia del guaguancó” (The Essence of Guaguancó), which is ironically not a rumba guaguancó.I posit that the guaguancó clave began being used more actively later (80s and beyond) because the music that was being created in Cuba had a higher degree of syncopation and, as you said, some musicians preferred the guanguancó clave for that. However, we should not take this to be the norm. With all that said, let me ask you the following: does it really matter which clave pattern is being played? Knowing that they are both rumba clave patterns, does knowing help you out in any way as a dancer or to understand the song better? Thank you so much for the detailed response to my question. Answering your question, currently as a dancer, for me it doesn’t really matter and also my steps doesn’t change when I know if the song is being played has a son/yambú clave or rumba/guaguancó clave. I guess if in the future if I want to learn more as a musician, then having a detailed explanation about the differences might really help to understand the song in a better way. I have a question regarding phrasing that I hope you can help me with. My understanding for casino is that while many outside of Cuba dancing with an 8 count/2 measure phrasing (leaders stepping with left foot on 1), Cubans in general dance with 4 count phrases (hence leaders stepping with left foot on either 1 or “5”). For son, I’ve noticed that in a lot of the videos of older Cubans dancing, they tend to have leaders start with the right foot on the “2” of the 8 count musical phrase. Can you help me understand why that is the case? Is it just like casino, where the dancers have the liberty to pick the “1” that they choose to dance on, as you describe in this article? Or is there something more particular about the count in son? The basic rule of dancing contra-tiempo is to start on the 3rd hit of the clave. In Son Clave 2->3 (pa pa, pa pa pa) this will make the leader start on 8 with their left foot, and thus the next foot to make a step will be the right foot, on the beat “2”. The same is true of the follower, just with opposite feet. The reciprocal case is with Son Clave 3->2 (pa pa pa, pa pa). Following the basic rule, the leader would start with the left foot on beat “4”, and will then take a step with the right foot on beat “6”. Thanks for your reply. What you said makes sense. Starting on the 3rd hit of the clave when dancing contratiempo feels very intuitive to me. However, why must that be done with the leader’s left foot? Wouldn’t it make more sense to choose which foot to break with so the dance lines up with the 8 count phrasing in the music? In most cases the leader starts with the left foot and the follower with the right. In Son and most other genres of Cuban and Afro-Cuban music the phrasing coincides with the Clave, and is built around the Clave, so you don’t even have to think about it most of the time. Hello, awesome read ! I don’t know if it is paradigmic, but, I instinctly tend to dance on 1, not on 5. This article helped me realize this somehow ; as said, music is a whole, and I personally don’t put so much effort finding the clave as some people seem to do, what I ear is a musical phrase with a begining and an ending, I am culturaly understanding the meaning of a phrase cause it is part of my education. I’m not a professional dancer, never went to any dancing school though, I just want to bring a few points. First, most often, the way people are teached to dance socially is by the “8 count” way , which allows to perform a basic step pretty simply. But in a show with highly tailored orchestrated music, and with choregraphied dances, you can be sure the count of the dancer is specific to fit the orchestration breaks, mesure / tempo changes, rubatos, etc… I’m pretty sure some don’t even think in term of ‘basic step’. It also seems that some dancers prefer to have 2 instances of “1234” instead of “12345678”. Or “1&2&” or any other way. It’s like there was 2 schools of counting for dancing ; the “social” ones counting the basic “123/578” as reference, which would eventually put you against the musical phrase – if the musicians decided to add an extra 4beats mesure, usually during a break i/e, or decided to change the side of the clave during the song. I just would like to know, if you had to dance to that music someway, using your basic step, how would you adapt your basic “12345678” step ? When this situation occurs, I will usually fill the extra 2 bars with something like a “cha-cha” left-right step, which allows me to fall on the next 1 correctly. I could add a shine, or do a spine. Thing is, without knowing the choregraphy bound to that music, I try to follow the rythm and to re-establish on one. I don’t know if casineros use to “break” a basic step, i/e starting the left-right-left- on 123/234 and THEN stop counting to 8, but rather starting a new bar “123”… ? Maybe you can help here ! Thanks !!! My point is, in “some” musics ( those who include rythmic variations ) teaching to count by the “12345678” systematically without refering to the music’s changes is just not methodological. I know a lot of instructors only teach how to perform turns, and never warn their students that the music they’re dancing to contains rythmical changes and stuff. Teaching that to dancing students, allows them to act conciously, and to decide whether or not they want to follow the “musical 1” or to impose their own count. Personally, I think it’s more esthetic and fitting to the music, counting WITH the music changes, but it requires more skill or knowledge. I’m still caught by surprise by a lot of rythmical breaks in cuban son in general, and I’m still better at ease to dance upon a song I know and already practiced. Finally, this is only a matter of taste. Personal choice ! I think this subject require a whole specific theory lesson, hence, when teaching to do basic turns and passes, it’s obviously easier for the student to train to a music that does not include tons of rythmical changes, cause if the student finds him/herself in a situation where the 123 becomes the 567 without being explained why, he/she can get confused real quick and then a simple vuelta gets incomprehensible. I also think it’s the responsability of the instructor, if he leads his students to dancing upon that type of music, to explain this theory to them. Now, if a music is made specifically to dance, why would it contain variations that could unbalance the dancers ? In latin culture, it’s part of the carnaval tradition, I was told by a musician it’s because during parties, they like to make chiste to the dancers, suddenly changing the tempo / or switching the bar, occuring the ladies to fall, or to lift the robes, as a joke ! At the same time, thoses changes allow you to do specific moves, shines or stuff, when you’re skilled enough to ride them. That is why we love them, they make the specificity of afro/cuban music ( cause those rythms do come from Africa ). It’s funny how their “dance” music is ridiculously straight-forward “boom-boom-” which is just poor in a rythmical sense. Anyway. That was my 2 cents… Thanks for your article, and if anyone knows how the cubanos casineros tends to count ( or may I say “SOME” cubanos casineros ), please let me know !! Thanks for the knowledge ! Hello Daybert, when the clave switch between 3-2 and 2-3, do I have to switch between 1 an 5 in my dance ? How to do that in practice ? Thanks for your article and your response.